What is the first thing that comes in your mind when you look at the Nespresso Inissia Espresso Maker? My Verdict Of The Nespresso Inissia Capsule Coffee Maker - Thumbs Up! Why don’t we find out? Let’s have a look at some unique features, brewing functions and also important information about Nespresso Capsules and Nespresso Compatible Capsules. That makes it easier for you to decide if this is the Espresso Maker of your dreams! For cappuccino and latte aficionados, there is a special Nespresso Inissia Bundle available that includes the Aeroccino Milk frother, which saves you a good amount of money! But more about that later. Does this Espresso Maker from Nespresso look cheap? But the price is so low that there is almost no excuse to say that it’s out of your budget. 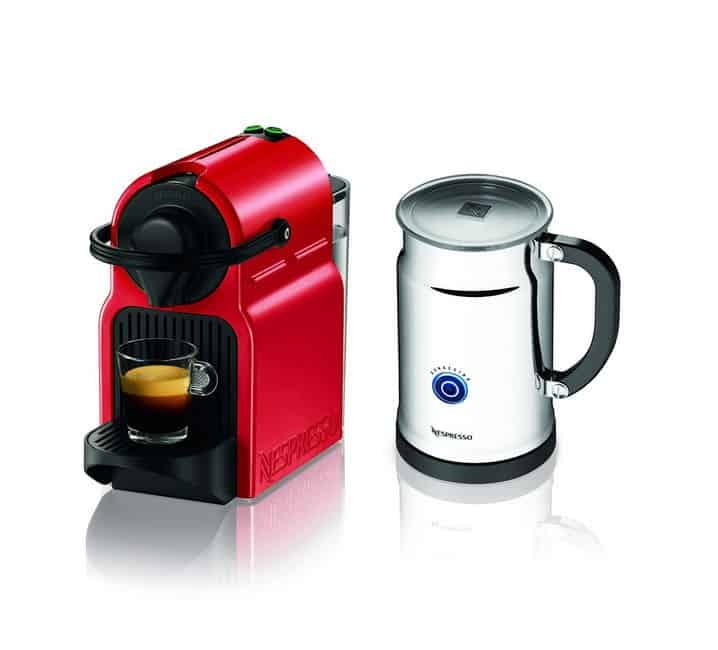 The Nespresso Inissia comes in several different colors like black, white or red. If you are not focused on a specific color you can save even more and select the one with the lowest price. The Nespresso Inissia is a straight-forward machine with no fancy display or menu but only two buttons, for Espresso and Lungo sizes. One of the special features is that the buttons are programmable if you push and hold them. This means the Inissia remembers your preferable amount of liquid for the next time. The body is made of a shiny plastic, but it does not look cheap at all! And with 5 x 9 inches it definitely fits in every corner of the kitchen. The water reservoir holds 0.7 liters (about 24 fluid ounces) – enough to not get upset by being forced to refill the tank over and over again. To keep your electricity bill low the Inissia Espresso Maker is also equipped with a power saver mode. Press and hold the brew button so the machine remembers your preferred amount of water! You can choose if the power off mode should be activated after 9 or 30 minutes. There is a 19 bar pump installed under the hood. High pressure is important for authentic espresso and it also generates the incomparable Crema. After turning it on, your eyes will blink about five times until the Nespresso Inissia is heated up – in seconds we talk about 25. Bear in mind that you may blink more or less depending on how much you crave for this next shot of caffeine. Imagine you just woke up, are already late for work or college, still need to shower but can’t function without your shot of caffeine. Usually, the brewing process with a single-cup coffee or espresso maker is a two-step routine. You start the machine, wait until it’s heated up, then you press the button to start the brewing process and wait again until it’s done. You notice that both steps force you to ‘wait’. And waiting takes time. Time you don’t have when you are in a hurry! Start the engine and during the warm up phase, you can press either coffee button. Now while you are taking your shower the Inissia Espresso maker automatically starts the flow after it’s heated up. And when you come back, a luscious, rich espresso with an inch of a thick and smooth layer of Crema is already waiting for you. Does it not make this small machine even more lovable? Cleaning is pretty simple because the water tank and drip tray are easy to remove. The capsule container can hold about 9-11 used capsules before you have to empty it. Descaling is necessary about every 1000 – 4000 cups based on water hardness. You can get the Nespresso Descaling Solution for about 25 bucks which is in my opinion a little expensive but fortunately not required too often. The machine comes with a set of 16 different orignial Nespresso capsules for you to find the flavors you prefer. The original capsules are a little pricey so I would recommend you to create a Nespresso Club account and not order them from a third party vendor online! Nespresso capsules cost you about 70-80 cents each (without coupons). I have seen third party vendors online that charge you for the same original Nespresso capsules up to 50% more. Unfortunately, there are not a lot of brick and mortar stores that offer the original Capsules. Alternatively you could save some money if you go with compatible capsules, for example from Gourmesso. If you are more into Cappuccino’s and Latte’s and seriously consider to get a milk frother anyways, look no further because this bundle is a steal! The prices change too often to give you an example of how much you can save. The Nespresso Inissia D40 is the cheapest Espresso Maker in Nespresso’s product line. But in my opinion it is a top-notch machine and provides you with a delectable, full-bodied espresso with an alluring layer of Crema. With its appealing design, it just looks charming on every kitchen’s counter. 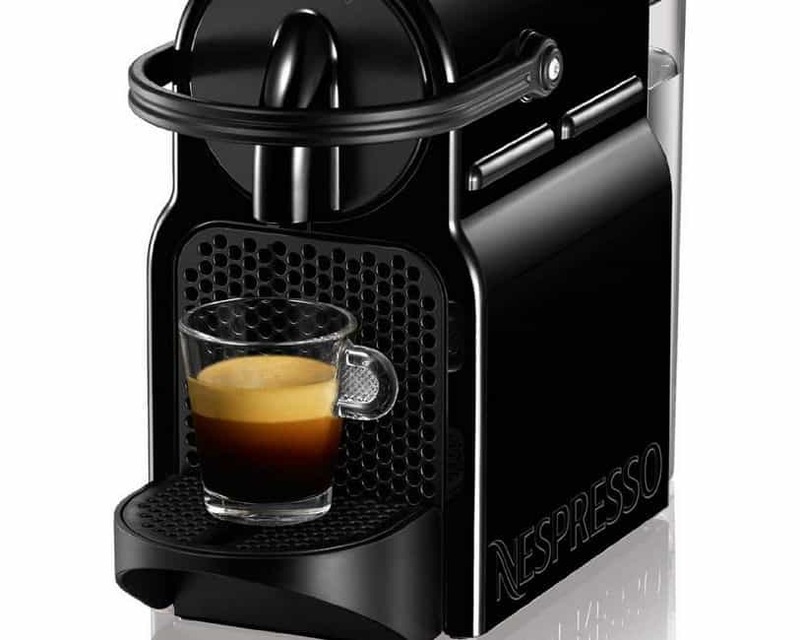 And the best, this Nespresso Espresso Maker is available at a fraction of the price of other Espresso Makers which saves you a lot of money! Get your Nespresso Inissia now and indulge yourself with a delicious cup of espresso! Oh, and by the way, Gourmesso has a small Trial Bundle of Nespresso capsules where you can save 30%! What is your opinion about the Nespresso Inissia? I would be thrilled to hear from you! Disclosure: I may get a commission for purchases made through eCommerce-links in my posts. More details here. Love your site. Great review. Do you know how this rates with regard to BPA? Is there a Nespresso machine that goes good in that regard? Thank you! thanks for the compliment. I hope I can keep up with the quality and see you back on my site again in the future. I hope I could answer your question.